Baby's "entourage" keeps expanding. Her admirers are far and wide. 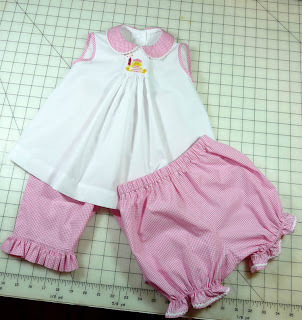 Another stitching friend made this adorable summer set. Don't you love it? So crisp and breezy looking for summer. 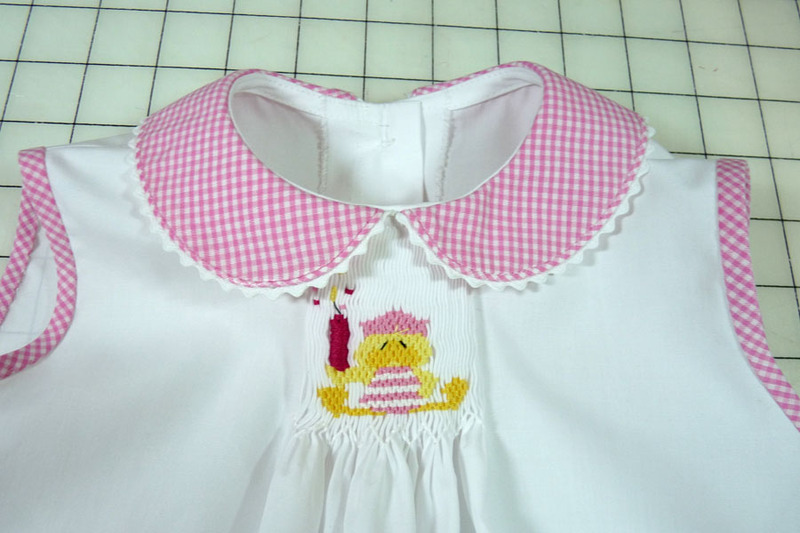 The smock plate is "Fire Quackers" by Little Memories. Baby's Mommy didn't want the plate to read 4th of July so she asked that the colors be changed. It was a great decision. While it will work for the 4th, it is not limited to just patriotic wear. Judy did pleat the center section a bit wider than called for to accommodate the pleats needed for the center motif. 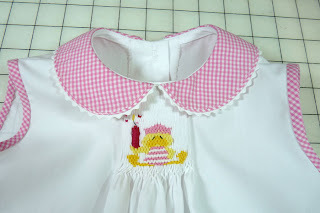 I love the piping with the rick rack on the collar. The top is Carol by Children's Corner, shortened and made sleeveless. 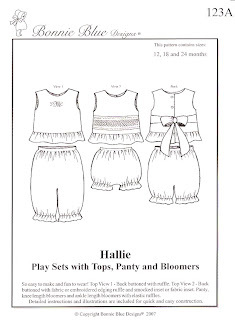 The long pants are also by Children's Corner, Lettie. Judy did say she made the pants a tad more narrow than called for in the pattern. They are perfect. 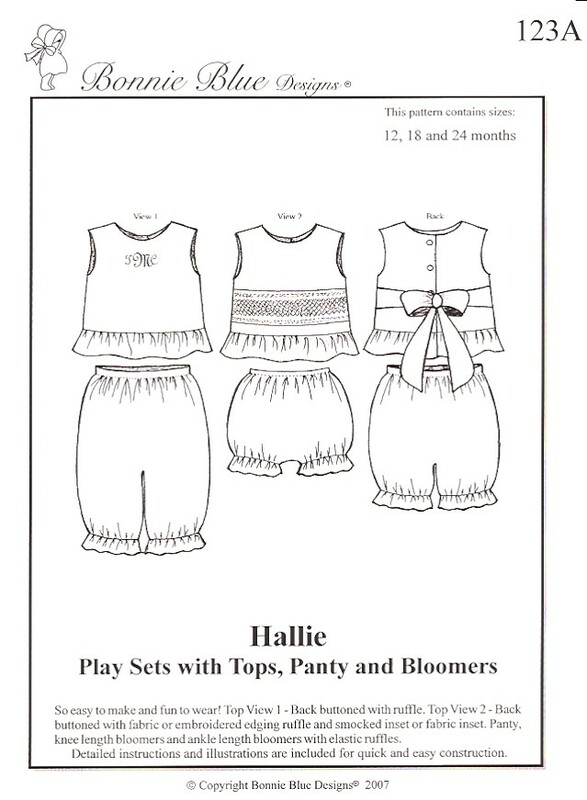 The bloomers are Hallie from Bonnie Blue. They are perfect for a cloth diaper baby. A wonderful fresh outfit for summer. I think we may need to get this pattern. 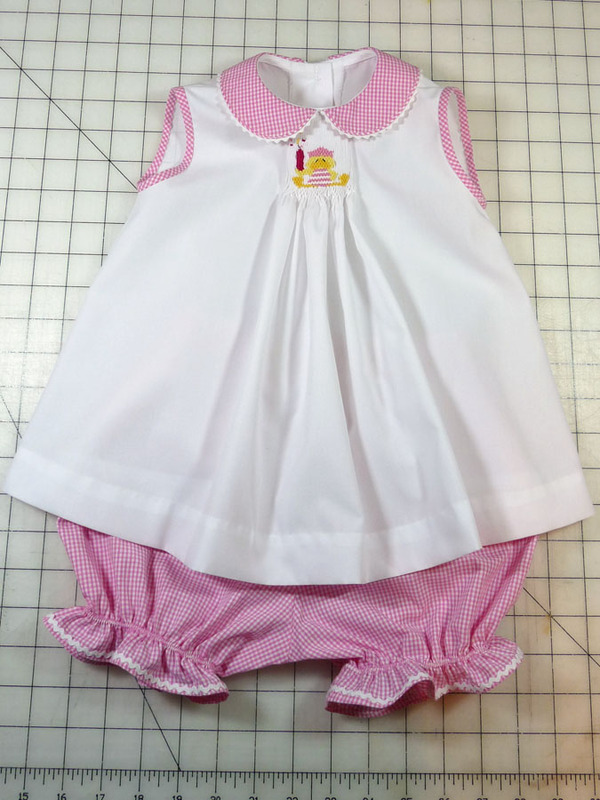 That little top is adorable. Judy does beautiful custom work as well. 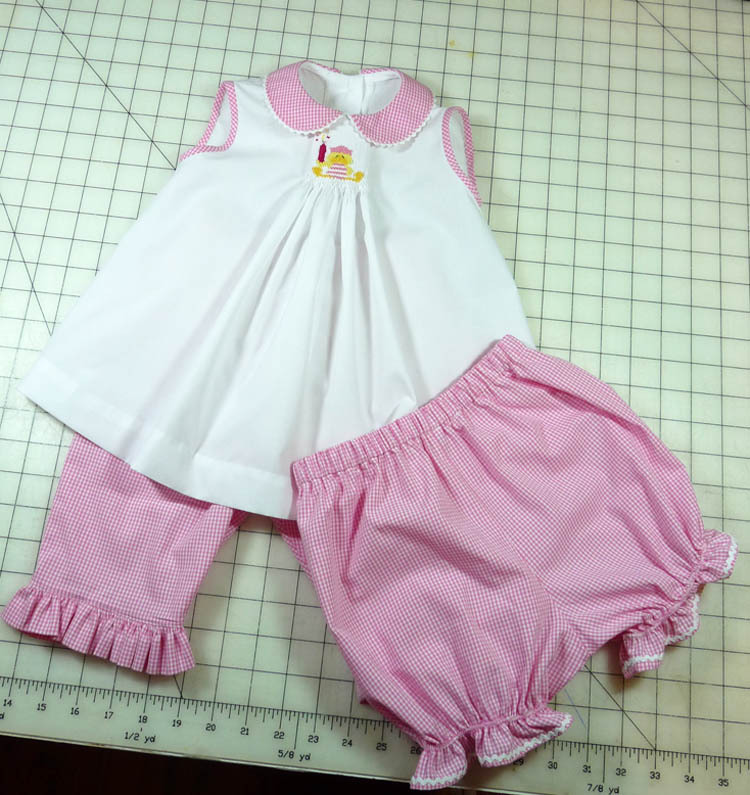 If your sewing time is limited, contact her at Sew Neat and she can get you what you need. 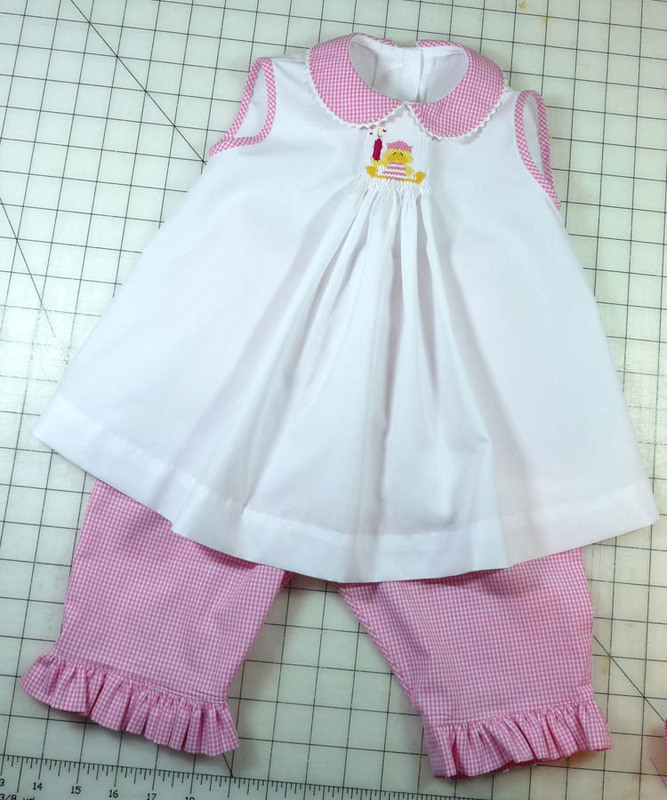 She also offers ready to smock if you want to do the fun part but not the construction. I can attest that her work is impeccable. Stop by and visit her website. 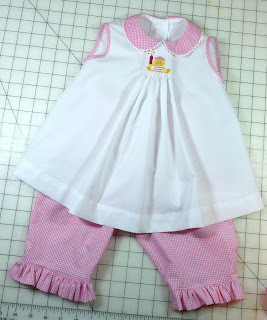 Parting shot: Not only is the outfit adorable, it is even cuter on! WoW! 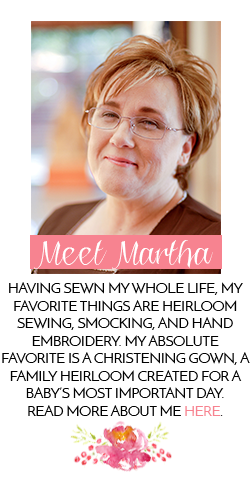 Thanks Martha! I'm blushing! It was a blast to create! She just gets sweeter every time I see her. Oh my, what a cutie. Just want to squeeze those chubby little cheeks and arms. She is growing so quickly. Oh, almost forgot to mention how great that outfit is. Just adorable! Aww! She is so squeezably cute! and that outfit is just precious. This is one of the cutest outfits I've seen. So sweet! 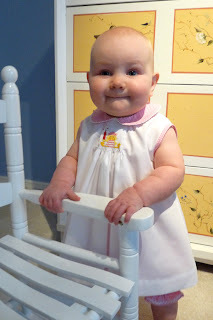 The outfit is precious and so are those wonderful chubby cheeks! What an adorable outfit! I love the colors too - Precious, precious precious! !